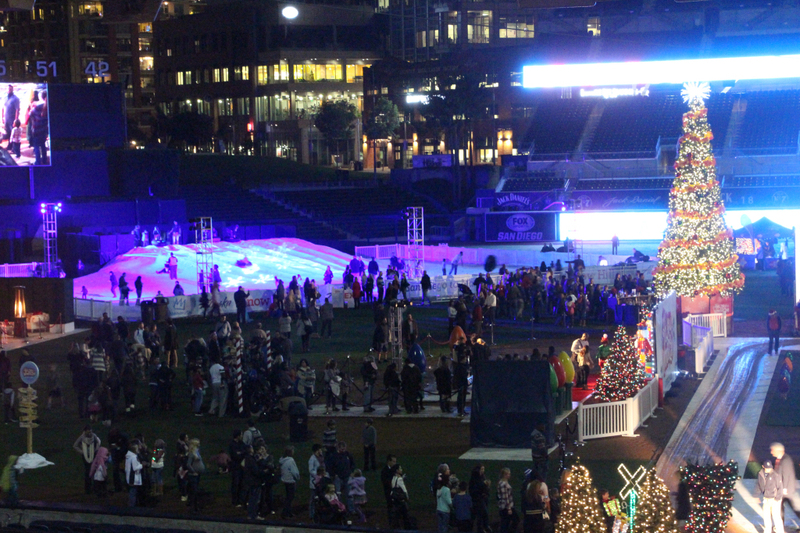 With the baseball season over with, the Padres are bringing festive cheer to Downtown San Diego by transforming a baseball stadium into the Holiday Wonderland at Petco Park. 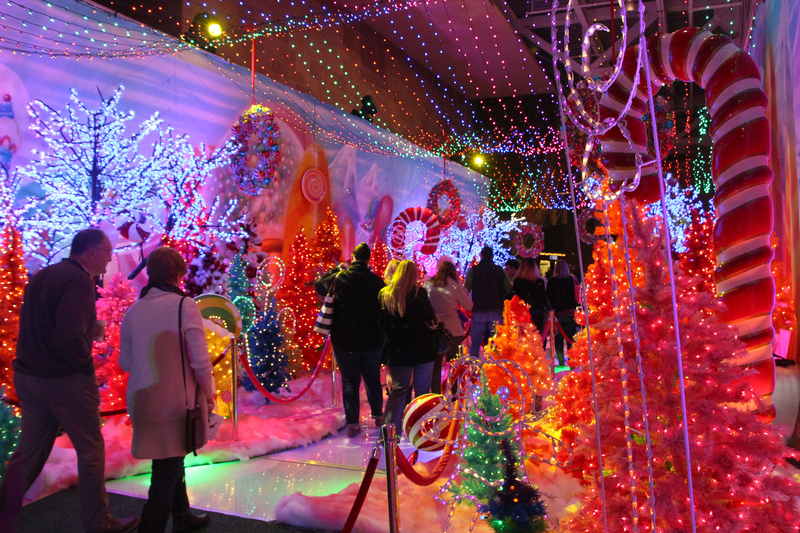 Thankfully the Padres are listening to the early criticisms of the Holiday Wonderland at Petco Park and are making some changes. To deal with the crowds, the Padres have expanded into the Park at the Park area with a “Frozen” fun zone, Snow Queen and Snow Princess photo op, snow globe photo op (moved from the field), a Polar Plunge (no idea what that is) and face painters. On the field, they have added a Merry Maze and a Carousel. Sadly, the photo with Santa and the train still cost $25 and $5 respectively. 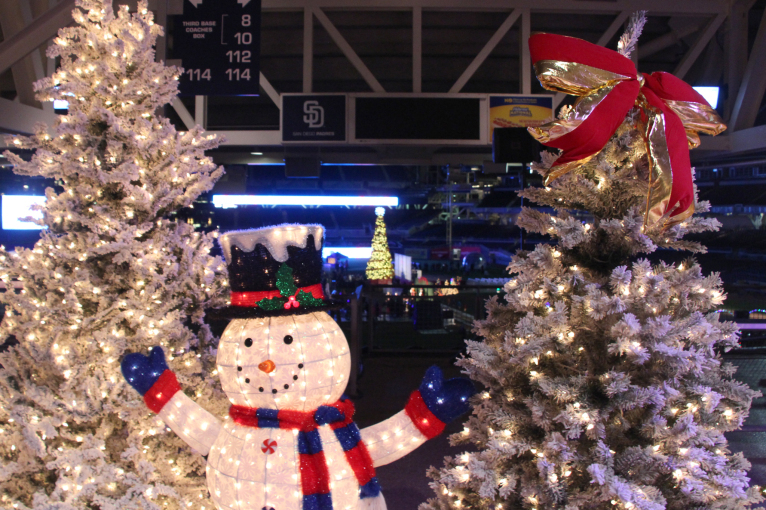 The sound of Christmas music, “snow,” lighted trees and bunnies (yes bunnies) welcome you as you enter the Holiday Wonderland at Petco Park. Continue up the stairs for Santa’s Workshop and more. 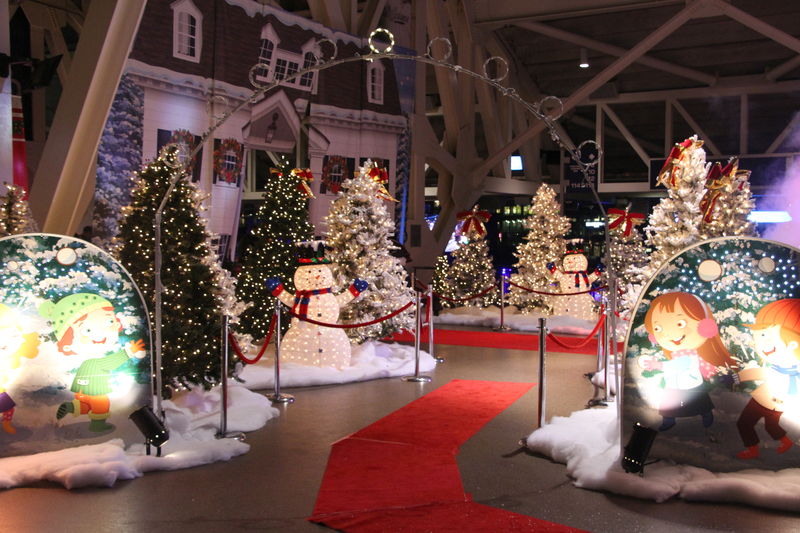 Make your way up to the main concourse level for more lights at Santa’s Workshop. Next up is Candyland stuffed with oversized candies, ginormous candy canes, and the smell of bubble gum wafting through the air. Finally, you will end up at the Christmas Morning House complete with decorated exterior and in the perfect holiday interior including a roaring “fire,” a Christmas Tree, wrapped presents and comfy seating (provided by Jeromes). This is a great spot to stop and take a family holiday photo. After you spend a few minutes trying to coax a smile instead of a silly face out of your child(ren), head on down to the field for main attractions. 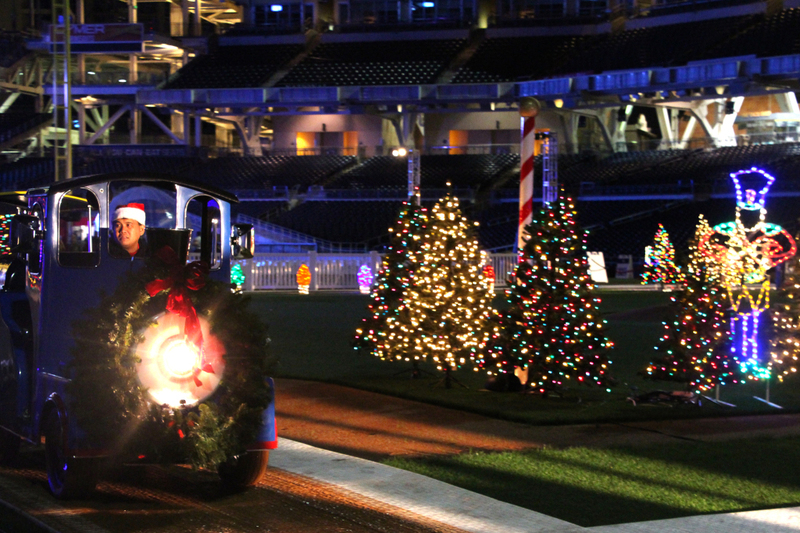 Snow, Santa, the Polar Express, Reindeer and more await just past the expensive baseball seats. Make the Snow Mountain your first stop when you reach the field. 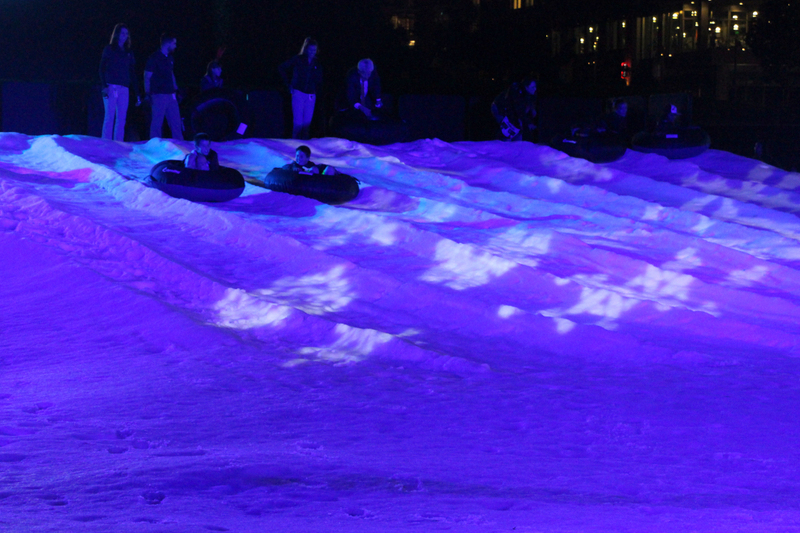 Make a beeline straight for the snow mountain since the line can get long as both young and old eagerly await to slide down on an inner tube. After you arrive back at the “foothills” of the mountain, make sure to craft the perfect snowball and “gently” toss it at your best friend…or worst enemy! 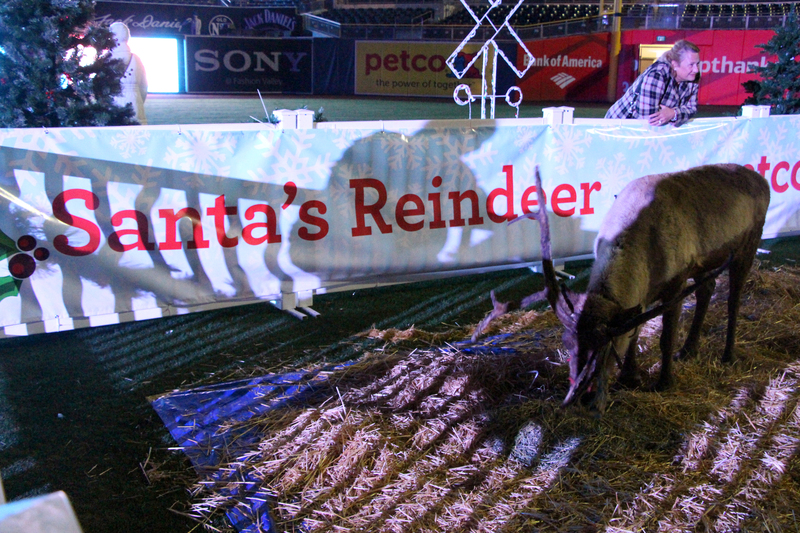 The upside to the Santa at Holiday Wonderland at Petco Park is the amazing backdrop. You can easily get a photo with Santa the whole family. While you will walk away with a print, the downside is the high $25 cost. I don’t know what the average rate is for a Santa photo, but I do know you can find photo ops for much less at other places in San Diego. Right next to Santa are the two “Polar Express” trains that chug around the baseball diamond with a few trees and lights in the middle. If you are willing to pay the $5 per person charge, hop into the train with the actual cabins on the right. In addition to the snow mountain and trains are a few live reindeer, a photo op snow globe (which is hard to photograph), holiday themed characters and a cocktail lounge for mom and dad meant for parental relaxation as the kids run back into the snow mountain line for the 5th time. 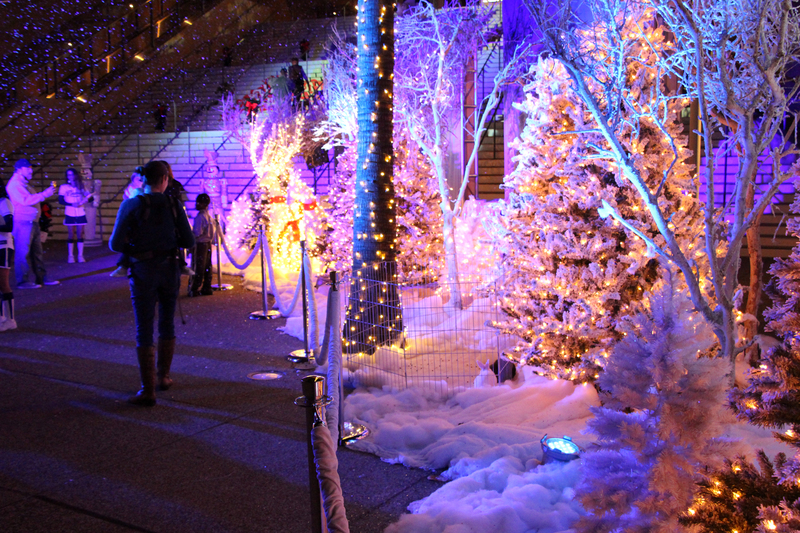 With all that Holiday Wonderland at Petco Park has to offer, visitors can easily have a wonderful night of festive fun. Just be prepared for the upsell costs and know that many of the activities are geared toward kids 4, if not 8, and older (in my opinion). My 1 year old enjoyed the lights and the train but not much else. So if you are looking for a new Christmas tradition, check out the Holiday Wonderland at Petco Park.